This this article follows on from initiatives undertaken by Pepsi in the 1970s and early 1980s that effectively repositioned the Coca-Cola brand during the period of the Cola Wars. Leading up to 1985, Coca-Cola was facing numerous challenges as a result of Pepsi’s marketing initiatives, campaigns and successful repositioning of both the Pepsi and the Coke brands. Of prime concern to the Coca-Cola management was that Pepsi was outselling Coke in the channels where consumers had a free choice – such as, supermarkets and drugstores. The Coke’s brand natural market leadership advantage over Pepsi was eroding as a result, with their market share falling 2.5 percentage points from 1980 to 1984. Coca-Cola had tried numerous activities, such as dramatically increasing its promotional spend, the use of a high profile celebrity as their spokesperson, substantial sales promotions and discounting – all of which was supported by very strong brand equity, extensive retail distribution and highly efficient logistics. However, despite all these activities, Coca-Cola was failing to reverse the trend of a declining market share, relative to their key competitor. As a consequence, Coca-Cola finally believed that the only marketing alternative left open to them was to introduce a new better tasting cola drink. Eventually, in April 1985, Coca-Cola reformulated their existing Coke brand and relaunched it as “New” Coke. By reformulating it, they replace the existing Coca-Cola product and remained with a single cola offering in the marketplace (in addition to their Diet Coke product that was only three years old at the time). Initially, prior to the public outcry, Coca-Cola’s management was very pleased with their decision and believes that this was a masterstroke strategy of strategy that would destroy Pepsi’s competitive position. Their intention, although not quite realized in the marketplace, is outlined in the following positioning map. 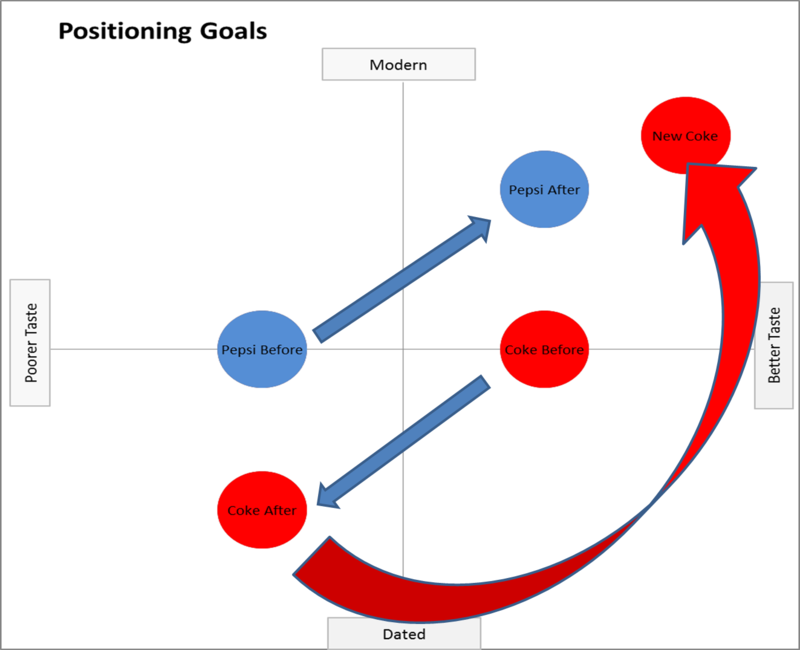 As you can see, prior to the introduction of New Coke, Pepsi had successfully repositioned the Coke brand and had established themselves as the better tasting and more current/modern cola brand – this repositioning was the foundation of Pepsi’s success and they were threatening to become the number one cola brand in America as a result. By introducing a “New” Coke to the marketplace, which Coca-Cola had determined through almost 200,000 taste tests was a better tasting product,and using a more youthful and exciting style of advertising, along with the word “new”; Coca-Cola truly believed that they had would successfully reposition the Coke brand as better tasting and modern as shown in the perceptual map above. As you probably know, much of the market was unwilling to accept a new flavor of Coca-Cola, which the population regarded as an American icon (whether or not they were consumers of Coke or not). Regardless of this outcome, it does help illustrate how a perceptual map can be used to help determine a firm’s competitive market strategy.